While a lot of Starbucks fans eagerly look forward to holiday favorites like the eggnog latte, there is something else to look forward to in the company’s holiday offerings this year. A portion of the sales from company’s three promotional holiday drinks – Peppermint Mocha Twist, Gingersnap Latte and Espresso Truffle – will be going towards the Global Fund. 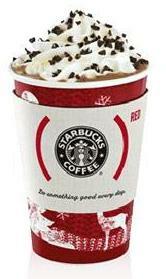 Five cents from the sale of each of the Starbucks(Red) drinks will be donated. Today, December 1st, is World Aids Day and until the stores close tonight the program will be extended and five cents from the sale of every drink on the menu will go to the Global Fund. The Global Fund is an organization that supports programs to fight AIDS, tuberculosis and malaria in over 100 countries around the world and is currently working to raise awareness of – and ultimately eliminate – AIDS in Africa. The (Red) program works to raise awareness and financial support for the Global Fund. It organizes the Product(Red) program that lets companies, including Starbucks, The Gap and other retailers, show their support, bring the Fund into the public eye and raise money for the charity.